Joseph Simora, senior GIS analyst for the York County Planning Commission, wore his Esri T-shirt to the Groundhog Day Celebration of Octoraro Orphie in Southern Lancaster County in Pennsylvania. 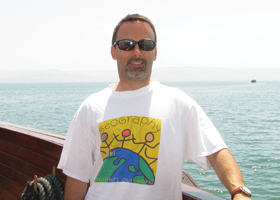 Ray Postolovski, US topo production manager with the US Geological Survey’s Denver, Colorado, office wore his Esri shirt while sailing the Sea of Galilee off the shores of Tiberias, Israel. On this trip, he visited Egypt, Jordan, Israel, and the State of Palestine. 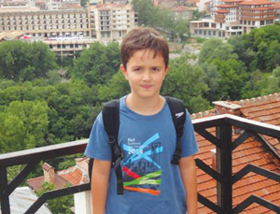 Mariyana Kostov, GIS manager for the River Valley Regional Commission in Americus, Georgia, sent this photo of her son wearing his Esri T-shirt in the city of Veliko Tarnovo in Bulgaria. 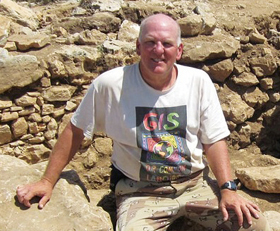 Tom Miller, GIS manager for the City of Shawnee, Oklahoma, poses with an olive press stone found at the Khirbet el-Maqatir archaeological dig in the West Bank of Israel. In May 2014, Miller joined 50 other volunteers who worked with Associates for Biblical Research at the site. 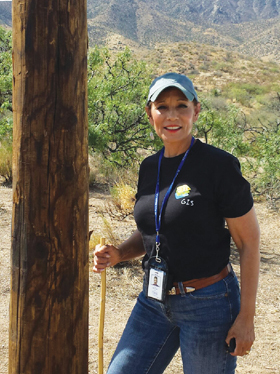 Eva Hinojosa of the El Paso Electric Company wore her Esri T-shirt while groundtruthing a customer’s job in rattlesnake country near the town of Organ, New Mexico. 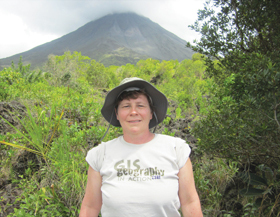 Peggy Staske, an engineering information technician for the City of Urbana, Illinois, traveled to Costa Rica with her husband and posed in her Esri T-shirt at the Arenal Volcano in La Fortuna, Alajuela, Costa Rica.